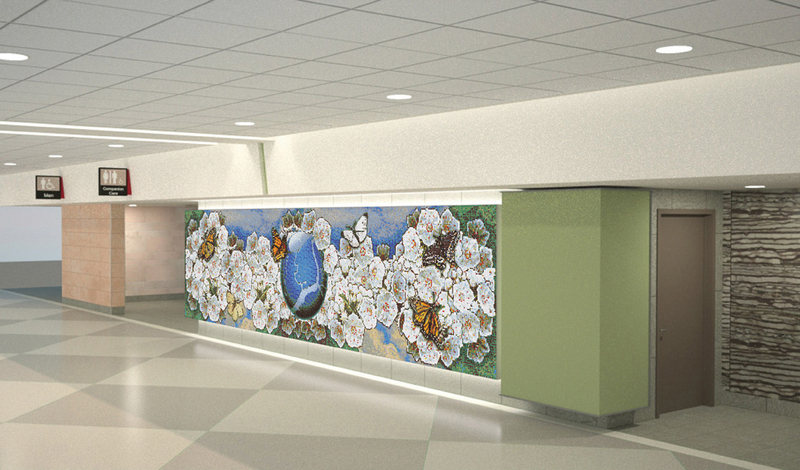 This mosaic would enliven the restroom’s entrance wall by creating a lively visual escape from the rush of activity in the terminal. The artwork depicts an abundance of mountain laurel, the state flower of Pennsylvania, against a background of shimmering sky. The cascading flowers are punctuated by butterflies, a metaphor for the joy of flight. In the artwork’s center a globe depicts the city of Philadelphia. Together these elements playfully celebrate the connection of Philadelphia and the world through flight. The artwork would be translated into a palette of 38-40 colors and laid out in a grid of 3/8″ vitreous glass tiles. Vitreous glass mosaic tiles are semi-transparent and light-reflective. They have a luminous quality with rich color-depth and consistency.